The University of Queensland TC Beirne School of Law, together with The Australian Law Journal, hosted “Religious Freedom after Ruddock”, a conference held on 6 April 2019. The attendees examined the future of religious freedom in Australia following the report of the Religious Freedom Review led by former Attorney-General, Philip Ruddock. The conference was highly successful with exciting discussions on diverse subjects, such as the Report recommendations, policy choices and limitations of the Report, religious schools and emerging issues. 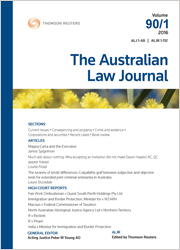 Selected papers from the conference will be published in a special edition of The Australian Law Journal in September, to be guest edited by Professor Parkinson.